by a forehead reduction (hairline lowering) procedure with us at the best clinics in Iran. What matters most in surgeries like forehead reduction? Perhaps, the natural looking results are the main concern for many, and a proficient surgeon can guarantee that. With many experienced surgeons, advanced surgical techniques, and short recovery periods, Iran’s turned out to be one of the reliable destinations for getting any cosmetic surgery done in. With the growing number of cosmetic procedures sought in Iran, this country's shaping the future of cosmetic surgery industry with no doubt. Forehead reduction is one of the popular cosmetic procedures performed in Iran. 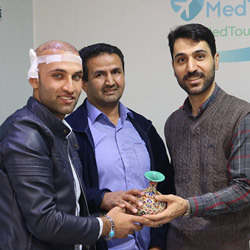 The great number of proficient surgeons and high quality of medical facilities coupled with very attractive prices make Iran an ideal destination for those who cannot afford their surgery at home. 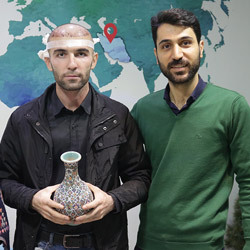 To give you a deeper insight into forehead reduction in Iran, this article describes why Iran is a perfect place for this surgery, how the surgery is performed, how much it costs, and many more. Forehead reduction also referred to as hairline lowering and hairline advancement repositions the hairline and reduces the height of the forehead. So, the forehead will be less dominant in a person’s face. The size of the forehead will also be more in sync with other facial features. By nature, hairs on every person’s temples thin out over time. By a hairline lowering procedure, this natural hair loss on temples and the receding hairline is reversed and a natural looking hairline is created on the forehead. Other reasons like genetics, hair loss, or a previous cosmetic surgery such as eyebrow lift may give a person a high forehead. Big foreheads limit a person’s options for having different hairstyles, so they often have to choose a hairstyle to cover the forehead in order to minimize the effect of the high hairline on how they look. Whatever the reason, hairline lowering surgery is the solution. Iran is ranked among the top 10 countries of the world in terms of the number of various cosmetic surgeries performed. What sets this country apart from other countries is the great number of plastic surgeons with ample experience who mainly focus on their patients' satisfaction. 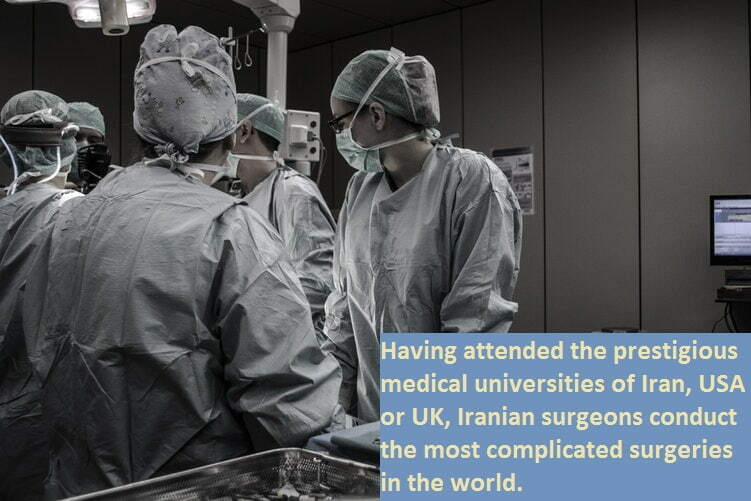 Having attended the prestigious medical universities of Iran, USA or UK, Iranian surgeons conduct the most complicated surgeries in the world. Despite what you may think of Iran's healthcare system including the quality of hospitals and medical facilities, the country is well equipped with modern private hospitals and first-class facilities. Walking into a private hospital in Iran, you will feel like you’ve stepped into a luxury hotel rather than a hospital. There are also various clinics specialized in the hairline correction in Iran. 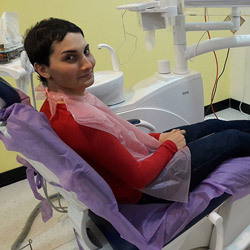 With professional staff giving consultations to potential candidates and giving them available options and even the alternatives for hairline correction surgeries, Iranian cosmetic clinics in major cities like Tehran, Mashhad, Shiraz, etc. are prepared to offer hairline lowering services to foreign patients. If you knew that you could get your forehead reduction done in another country with the same quality but considerably lower price, would you go for that? In Iran, medical/cosmetic procedures are 50%-70% cheaper than what you would pay in other countries. This is because the Iranian currency is weaker and the labor cost is lower as well. The average monthly salary of a nurse is around $3,000 to $8,000 in countries like the UK and US. However, an Iranian nurse monthly receives $800 to $1,500. Iranian doctors earn around $10,000 per month, while American doctors receive $18,000 per month. This is while doctors in Iran are high earners, meaning that other workforce like hotel and restaurant owners who benefit from a patient traveling to Iran earn much lower. That is why this country comes up with surprisingly affordable prices. 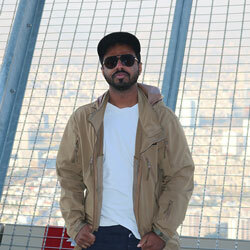 The cost of a forehead reduction in Iran ranges between $600-$1,000. This price includes all the related fees such as surgeon's visit, anesthesia, and surgery fees. This is while the same procedure costs from $2,000 to $7,000 in countries like Australia, USA, and the UK. Accordingly, the average cost of a hairline lowering in Iran is 60% lower than in western countries. This surgery in Iran is also 20%-40% cheaper than in other famous medical tourism destinations like Turkey, Mexico, and Thailand. How Is Forehead Reduction Surgery Done in Iran? This surgery starts with an incision at the front of the hairline, and if necessary at the temples. The scalp tissue is then raised and gently stretched so that the hairline can be lowered. This way, the surgeon removes a portion of the forehead and shortens it up to 2 inches (5 cm). This procedure is recommended when a significant hair loss has occurred in the front of the head. 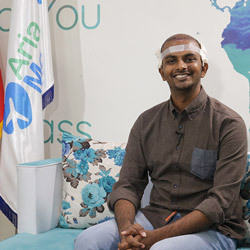 In this case, a hair transplant is performed to relocate hairs from the donor area, which is usually the back or sides of the scalp, to the front of the head. This results in the lowering of the hairline, hence the reduction of the forehead height. 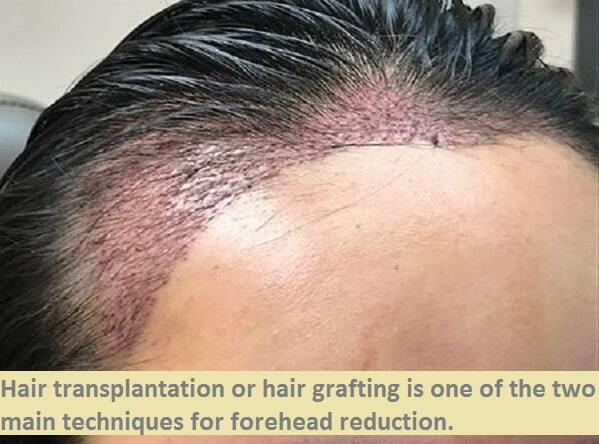 To learn more about this procedure, go to hair transplant in Iran. These two methods are occasionally combined together, with hair grafting done as the second step to the scalp advancement. The surgery is usually performed under general anesthesia. Depending on how complex the surgery is, the forehead lowering procedure takes about 1.5 to 2 hours. A maximum of one night stay in the hospital may be required after the surgery. On some occasions, the patient is discharged on the same day of the surgery. Like any other cosmetic surgery, surgical lowering of the hairline can be combined with other procedures, such as brow lift or forehead reshaping, to get a more pleasing result. The brow lift is aimed to reposition of the brows and smooths the forehead skin as well. Whether you can undergo a brow lift together with your forehead reduction is something that must be determined by your surgeon. To learn more about this procedure, go to brow lift surgery in Iran. Am I a good candidate for hairline lowering? Women with big foreheads are generally better candidates than men. Men can be good candidates for hairline lowering if they have thick hairline and have no previous history of progressive hair loss. One necessary criterion for forehead correction surgery is having flexible forehead skin which can be easily manipulated. During the consultation session, the scalp laxity, the distance between the eyebrows and hairline, and the overall physical features will be examined and considered in the decision-making process. Foreheadplasty is considered to be an outpatient procedure and it promises recovery between 1-2 weeks. However, the patient needs to avoid strenuous exercise and activities such as martial arts, swimming, running, going to the gym or any other contact sports, for 6 weeks. The patient may experience moderate pain, discomfort, and swelling within the first few days after the surgery. In the majority of hairline correction surgeries, a protective and support dressing is placed around the forehead in order to control the swelling and minimize the post-op movements. Putting ice on the areas that are swelling or burning helps relieve the pain and swelling. Painkillers can also be taken after consulting with the doctor. It is also recommended to avoid smoking and drinking alcohol during the recovery period. Before going through with the surgery, the patient must consider taking some precautionary steps in order to avoid complications. Patients must avoid taking any anti-inflammatory medicines at least a week before the surgery because they hinder the hairline lowering recovery process. In order to avoid fluid retention and swelling, they must avoid salty foods and alcohol consumption. It is also recommended to avoid smoking before the surgery. It is beneficial to eat foods that strengthen the immune system and prepare the patient for the surgery. Is hairline lowering surgery painful? After the surgery, the patient might have moderate pain or discomfort for about 3 to 5 days. One must avoid washing their hair for at least two days. Does forehead reduction’s scar remain visible? When there is a surgery, there’s also the possibility of scarring. Forehead reduction may leave a thin scar around your hairline. However, this scar will be concealed within your hairline and gradually it would be invisible. With choosing the right surgeon, there would be no need to worry about scar visibility. What are the possible side effects of hairline lowering? Bruising: It will be disappeared within 2 weeks. Infection: Infection doesn’t happen frequently, and may happen in less than 0.5% of the cases. If it occurs, a course of appropriate antibiotics will be required. Facial muscle weakness: If it does happen it mostly affects the forehead area, which is temporary and lasts about 6-8 weeks after the surgery. Altered sensation in the scalp: This is one of the expected post-op side effects that will probably take 1-2 years to resolve and improve. Temporary or permanent hair loss around the scar: Hair loss after the surgery usually doesn’t have long term effects and grows back up until 4 months after the procedure. How soon will forehead reduction results appear? If the surgeon goes with scalp advancement to reposition your hairline, you’d be able to see the results a few weeks after the surgery. With a hair transplant procedure, the hairline correction would take several months to appear as the lowered hairline is visible only after the hair growth.